Becky Thatcher is a whippersnapper who has plenty of time to get up to scads of mischief. Her daddy, Judge Sawyer, is a busy and important man and her mama is st ill mourning the loss of their son, Becky’s older brother Jon. This leaves Becky with little supervision and ample opportunity to put her wild imagination into action. Her adventures lead her into some potentially dangerous territory as she decides to investigate the Pritchard Brothers herself, two outlaws suspected of train robbery, bank robbery and possible murder. Becky also manages to convince her new friend Amy Lawrence to join her in accepting a bet from Joe Harper and Sid Sawyer– a bet to steal from the Widow Douglas during Saturday’s full moon. 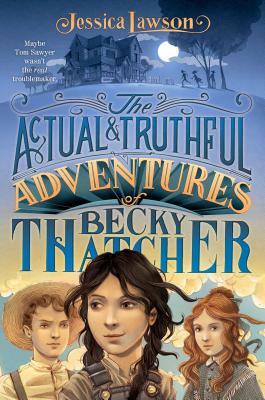 Becky’s fearlessness and knack for telling whoppers makes for great stories as we join her for these daring escapades.